A Portuguese-language edition of E.O. Wilson’s book, A Window on Eternity: A Biologist’s Walk through Gorongosa National Park, is now available. 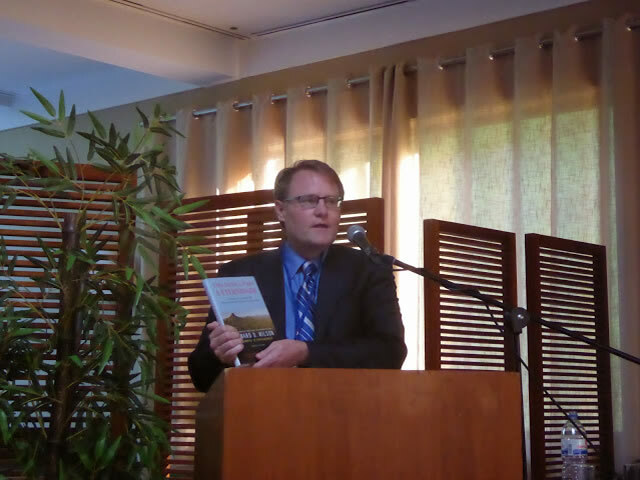 A book launch was held this past spring in Porto, Portugal. Read more below about this remarkable book. Edward O. Wilson is one of the most celebrated scientists in the United States, a world-renowned biologist and two-time Pulitzer Prize–winner. 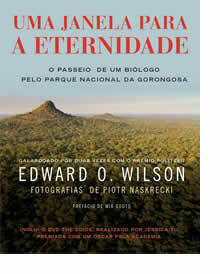 In his new book, A Window on Eternity: A Biologist’s Walk through Gorongosa National Park, Wilson shows why biodiversity is vital to the future of the Earth and to our own species through the story of Gorongosa National Park, which is located in Mozambique and is among the most diverse places on earth. Last year Wilson returned to Gorongosa National Park for the formal opening of the Edward O. Wilson Biodiversity Laboratory. The E.O. Wilson Biodiversity Foundation will be communicating the work of scientists at the Laboratory through its partnership with the Gorongosa Restoration Project. Gorongosa in Mwani tongue means “place of danger.” And it has been just that. After Mozambique won its independence from Portugal in 1975, a civil war broke out and raged for sixteen years. Because the park was close to the headquarters of one of the opposing armies, it became a battleground. Its tourist facilities were destroyed, and soldiers, hungry for any food they could forage, killed many of the large animals that once teemed in the park. The remarkable story in A Window on Eternity covers how Gorongosa was destroyed, restored, and continues to evolve back to its former state. 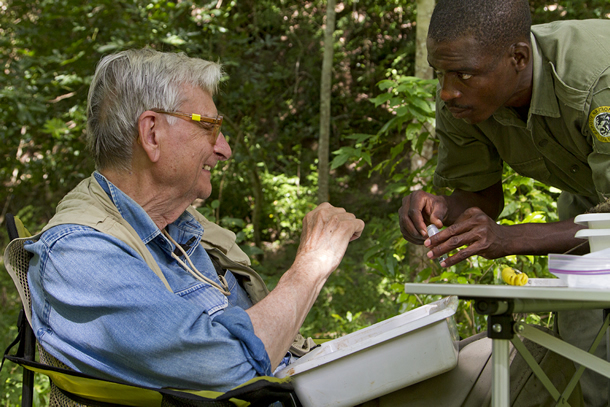 Edward O. Wilson examines ant species with a Gorongosa National Park guard. “We are glad that Mozambican scientists and international scientists will work side-by-side, learning from each other,” said Park Warden, Mr. Mateus Mutemba. Photograph by Piotr Naskrecki. 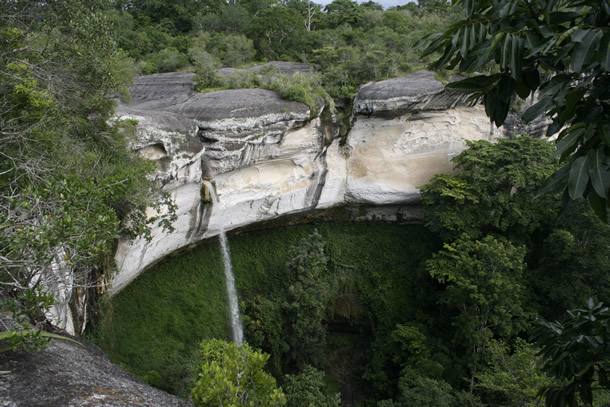 Gorongosa National Park is home to some of the geologically diverse ecosystems on the African continent including, caves and deep gorges of the Cheringoma Plateau. Photograph by Piotr Naskrecki. BioBlitzes are censuses of numbers of local species found and identified in a restricted area during a fixed period of time. Featured throughout the book are the creatures that he and his team have found—big and small alike—as illustrated in more than fifty stunning, full-color photographs by one of the world’s best wildlife photographers, Piotr Naskrecki. They range from large animals such as African elephants, lions, baboons, and warthogs; to birds, like yellow-billed storks and village weavers; to reptiles like the pygmy chameleon and Nile crocodile; to insects, including a variety of ants (Wilson’s specialty) and katydids; to spiders like the orb weaver and tarantulas. 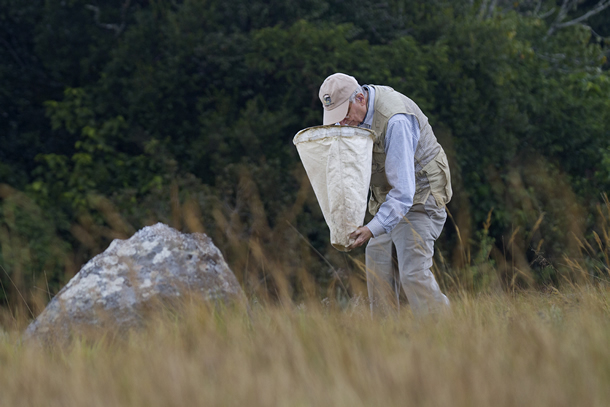 Edward O. Wilson collecting insects—a passion that has lasted for over 60 years—in Gorongosa National Park. Photograph by Piotr Naskrecki. As Wilson examines the near destruction and rebirth of Gorongosa, he analyzes the balance of nature, which, he observes, teeter’s on a razors edge. Loss of even a single species can have serious ramifications throughout an ecosystem, and yet we are carelessly destroying complex biodiverse ecosystems with unknown consequences. The wildlands in which these ecosystems flourish gave birth to humanity, and it is this natural world, still evolving, that may outlast us and become our legacy, our window on eternity. Readers are introduced not only to remarkable animals but also to the people who are helping to restore the biodiversity in Gorgongosa. Gregory C. Carr, an American businessman and philanthropist, has adopted the park and its fauna and flora as his mission under the nonprofit Gregory C. Carr Foundation. Carr and Wilson, bound by a common devotion to wildlife conservation, have become collaborators and close friends in helping to extend conservation efforts. Because of Carr’s lobbying and advocacy, Gorongosa National Park has extended its boundaries and is creating schools and health clinics for local people, integrating human development with conservation, along with the newly dedicated Edward O. Wilson Biodiversity Laboratory. Here, in one of the remotest parts of Africa, the local people are beneficiaries of Africa’s greatest wildlife restoration story. Conservationist Joyce Poole, one of the world’s leading authorities on the African elephant, has helped the traumatized elephants—who are scarred from the civil war—acclimate to humans. Her photographer-naturalist brother, Bob Poole, accompanied Wilson on his trips to Gorongosa, as did writer Morgan Ryan, who is co-author of E.O. Wilson’s Life on Earth, an iBook textbook, being prepared by the E.O. Wilson Biodiversity Foundation. Entomologist and photographer Piotr Naskrecki took most of the stunning photographs in the book. A DVD also accompanies the book and features Wilson’s wildlife guide, Tonga Torcida. It was made by Academy Award-winning director Jessica Yu. 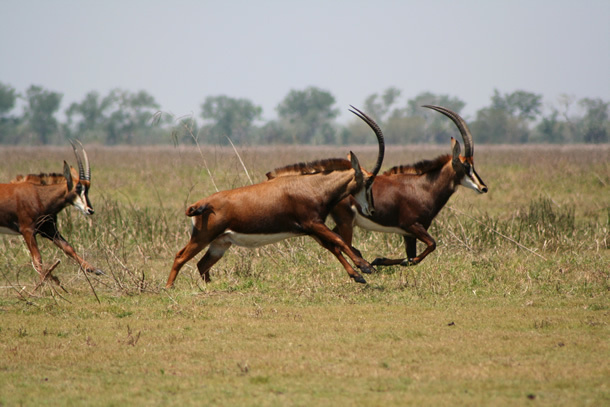 Sable are one of 17 species of antelope in Gorongosa National Park. Thanks to the restoration effort, some large animal numbers have increased by as much as 40 percent. Photograph by Piotr Naskrecki. Praised as “one of the finest scientists writing today” (Los Angeles Times), Wilson uses the story of Gorongosa to show the significance of biodiversity to humankind. And who wouldn’t want to walk through paradise with this most experienced and articulate guide? A Window on Eternity: A Biologist’s Walk through Gorongosa National Park is available for sale from Simon & Shuster. Read David Edmund Moody’s review of A Window on Eternity in the Huffington Post. Stuart Pimm, a member of the E.O. Wilson Biodiversity Foundation’s Board of Advisors, writes about A Window on Eternity in Nature. Read Jonathan Weiner’s review of A Window on Eternity in The New York Times.